In my last post I wrote about how to build compound molding. 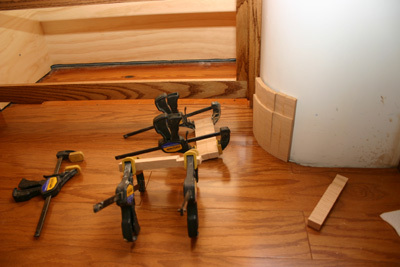 There were some questions about how I built that curved baseboard so I’ll show how I did it. There are basically four ways to build that curve using solid lumber. What I did really wasn’t the best way to do it. Normally, you would steam the wood and bend it in a jig. 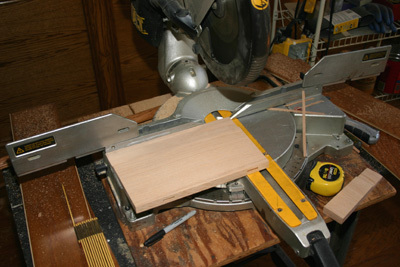 But even though wood steamers are a relatively easy DIY project, I haven’t gotten around to building one. Also, bending 1″ nominal hardwood stock to as shallow a radius as I needed would have been problematic, at least with my skills. The second method involves building up thin veneer layers of solid lumber around a form much like plywood. You can construct a very small radius this way and lots of glue will ensure a stable curve. If I had had access to a bandsaw with a resaw blade, this is how I would have done it. The third way is to saw lots of narrow vertical kerfs in the back of the stock, leaving a thin facing layer to make it bendable. This method wouldn’t have worked for me because the board has that half-lap detail. 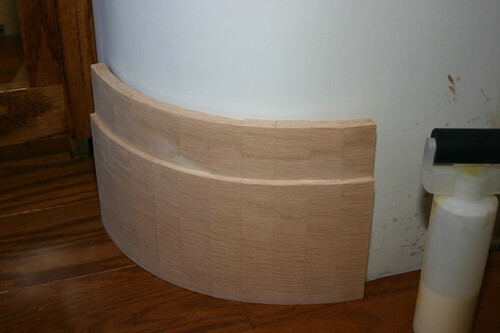 I used Option #4: build up the curve using several narrow pieces of lumber edge-laminated together. It’s not really a smooth curve but a polygon which you sand to make the curve. While it’s the least artful method, it’s how all the convex woodwork was originally built in this house. How do you calculate the miter and width of each piece? In my case, dumb luck made this almost a textbook exercise. Using a tailor’s cloth tape measure, I found that the corner’s circumference was eleven inches. If I were to use one-inch wide pieces how many pieces would I need? Eleven pieces, of course. But how do you calculate the miter angle for each piece? Even though it’s a rounded corner, the intersection of the two walls is still 90 degrees. So I needed to break that down. If you glue together eleven pieces of lumber you have ten joints. A 90 degree angle divided by 10 equal joints would mean that each joint would have to be 9 degrees. Since each piece has two equal miters, then the miter angle was 4.5 degrees. All I needed was grade school math! Construction was pretty routine except that clamping was a bit of chore once the curve extended past 30 degrees. So I constructed the baseboard as three sets. Then I assembled them around the jig I’d used to make the knife to construct that plaster corner: a plastic bucket. A belt clamp held the pieces snug while the glue dried. 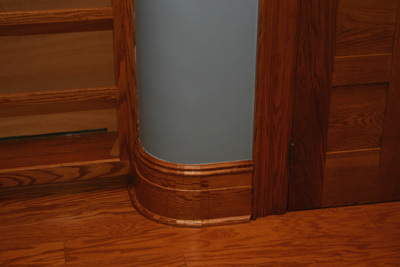 The cap and shoe moldings were cut using the same miter but were only glued to the baseboard with a few discrete brad nails.